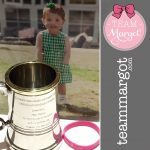 Team Margot campaigns for every individual who is eligible, particularly those of mixed heritage, to register as a stem cell and bone marrow donor. In October 2013, 14-month-old Margot Martini was diagnosed with an extremely rare form of blood cancer, and required a bone marrow transplant (also known as a stem cell transplant) to stand the best chance of survival. 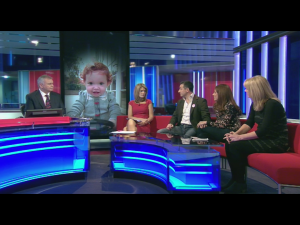 Family and friends came together as Team Margot to raise awareness of Margot’s plight and others desperately seeking a blood stem cell donor match. Margot’s mixed family heritage was the key obstacle to finding her a ‘perfect’ tissue-type match, owing to the lack of diversity on stem cell and bone marrow registers. Margot eventually found a ‘suitable’ donor match and received her bone marrow transplant in February 2014. 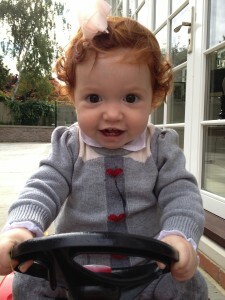 Unfortunately, Margot’s Leukaemia was extremely aggressive. She relapsed during that summer and passed away, aged 2 years and 2 months, on the 27 October 2014. Margot’s family are unspeakably grateful to her selfless anonymous donor for his miraculous gift, which gave Margot extra time with her family and loved ones. 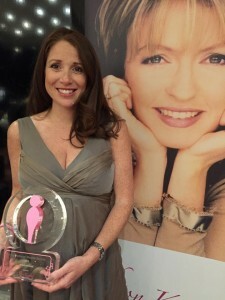 Team Margot launched Margot’s donor appeal on Christmas Eve 2013 and has been credited with having run the most high profile global donor appeal anywhere in the world, embracing national and international TV, radio, print, online, outdoor media and Virgin America flights. 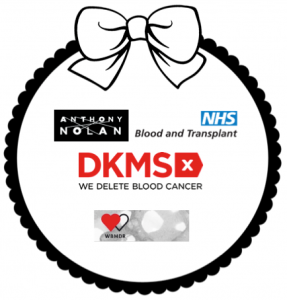 Within the first 6 weeks of launch the charity, DKMS UK (previously named Delete Blood Cancer UK) received over 50,000 requests for swab kits in the UK alone. The first of these potentially life saving transplants occurred by way of peripheral stem cell donation in late 2014 thanks to an anonymous donor who registered after hearing of Margot’s appeal. The second was a bone marrow donation by our friend Katrina Krishnan Doyle – click here to see her video blog. Team Margot works with all the UK organisations in the stem cell / bone marrow arena & we are reaching out to the international organisations too – we don’t mind how you choose to register, only that you do please register ! On average, there is someone every week who donates stem cells or bone marrow, having joined the register because they were inspired by Margot, or the efforts of Team Margot. This means that together, we’re saving lives. We imagine a world where every patient in need of a bone marrow transplant is confident of quickly finding a matching donor. We want to help save the lives of all those people who, just like Margot and our family, never thought they’d need a bone marrow transplant. 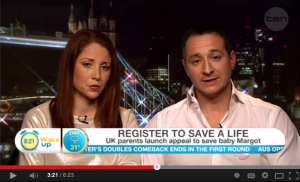 We urgently need more people with mixed heritage to join a stem cell register. There are over 37,000 people worldwide in desperate need of a bone marrow or stem cell transplant (including 2,000 in the UK), but they must first find a matching donor. The shocking fact about bone marrow & stem cell transplants is that people with certain ethnic backgrounds are massively disadvantaged. Team Margot Foundation is a Member of the National BAME Transplant Alliance (NBTA). Research undertaken by the UK Registry, Anthony Nolan confirms that white, Northern European patients have a 69% chance of finding their ‘perfect match’, i.e. a 10/10 antigen match (more commonly referred to as a ‘tissue type’ match). By stark comparison, people from the Black, Asian and Minority Ethnic (BAME) communities have only a 21% chance of finding an equivalent match. The odds are worse still if, like Margot, you happen to be mixed heritage. When it comes to the donor-patient matching process, race and ethnicity is vital and there are too few people of mixed heritage registering to be stem cell donors. More donors from multi-ethnic descent are needed. Arguably, we are all mixed heritage. Click here to register as a stem cell and bone marrow donor. 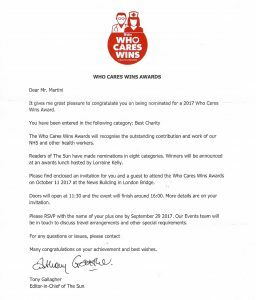 Team Margot Foundation has been nominated as ‘Best Charity’ in The Sun’s inaugural ‘WHO CARES WINS’ Health Awards, to be held on Tuesday 11 October 2017. THANK YOU everyone for your support and many congratulations ! Margot’s father, Yaser was awarded a Lifetime Achievement Award at the All-Party Parliamentary Beer Group Awards Dinner on Tuesday 17 May 2016. The All-Party Parliamentary Beer Group, formed as the Parliamentary Beer Club in 1993, promotes understanding among Parliamentarians of the UK’s beer and pubs industries. Over 300 MPS and Peers of all parties are members. Around 60 UK MEPs are honorary members. The Group is supported by 50 individual brewing and licensed retailing companies, as affiliated corporate members. An officially registered all-party parliamentary group, it is the largest industry group at Westminster. Britain’s pubs raise more than £100 million for charity and good causes each year. Indeed, from the outset, the pub industry supported Margot’s appeal for a donor and has since continued to be very supportive of Team Margot’s work. Thank you. 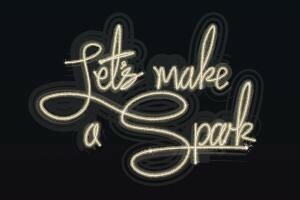 The Martini Family was awarded a Delete Blood Cancer UK Special Award for Outstanding Contribution at the “Let’s Make a Spark” Delete Blood Cancer UK Awards Event on 5 November 2015. This is their highest award, which recognises the significant and inspirational role played by our family in raising awareness of the lifesaving work of Delete Blood Cancer UK, acting as an ambassador for the Charity. Vicki, who received the award, said: “When we learned that our daughter needed a bone marrow transplant and we launched Margot’s appeal, family and friends came together as Team Margot and remarkable things started to happen. Team Margot is honoured to have received a specially commended award at the 2014 Anthony Nolan Supporter Awards hosted at the House of Commons, in the category of Black, Asian and Minority Ethnic (BAME) advocate of the year. We consider it a great privilege to be working with Anthony Nolan and wish to congratulate all the award winners and nominees on their fantastic work.